"Acrylic paint is a really fun, affordable, and easy way to personalize your shoes while getting extra life out of ‘em." I’ve been living life in white, rubber-soled canvas sneakers for the last five years—I’m a huge fan. For me, it’s all about the style (and the all-purpose nature). I love the way they look, but I also love the practicality. Whether they’re Keds, Kate Spade or knock-off, I can wear them with pretty much everything year-round (OK, they’re not technically waterproof, but that hasn’t stopped me yet). And they’ve passed my swing dance test—that’s part of the reason I fell in love with them in the first place. For the most part, every pair of canvas sneakers I’ve owned has held up pretty well. I spray my shoes with protective coating before I wear them, and bleach them every now and again to keep the shoes looking fresh and clean. But after awhile, no amount of protective coating or bleach can salvage that much wear, especially given the amount of time I spend working on projects in the shop. I recently tossed my ratty old work pair, then realized I needed a new work pair and had an idea: acrylic paint. I chose a bright turquoise color, layered it on my canvas sneakers, and now I have a fun pair of work shoes that were wildly easy (and budget-friendly) to make. 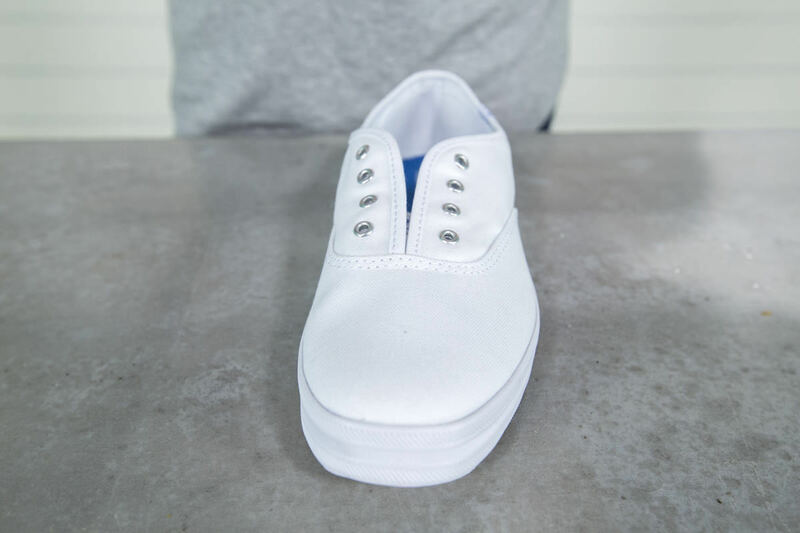 Today, I’m sharing the process so you can upcycle your own canvas sneakers, too. 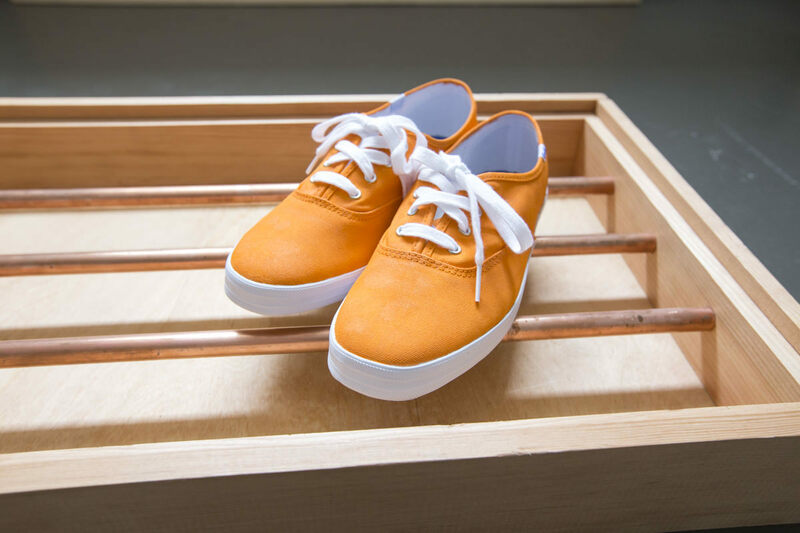 Canvas is meant for art, so there are tons of materials (like permanent markers, for instance) you can use to spruce up your shoes. I chose acrylic paint because it’s opaque, which makes hiding stains and dirt a non-issue. And whether your shoes are white or bright yellow you can change up the color! I picked up a basic option at our local superstore. I’m a perfectionist, so I like to take a picture of my canvas sneakers before I remove the laces so I can put them back the exact same way they were before. It’s an art! You can document the intricacies of your laces, or you can simply remove them. I picked out two brushes: one for painting large surfaces, and another for detail work. I found that by the time I got to the second pair, I was way better at painting and staying in the lines than I was on the first pair, and could use the larger brush for most of it. Ultimately, you want to choose a brush that you’re comfortable with. We’re painting everything that’s canvas. I painted freehand, but you can tape off the rubber sole if you want to be extra sure it stays totally white. I can’t paint a picture for the life of me, but I can paint interiors like nobody’s business, so I worked without tape. While I did most of the work with a large brush, I went in with a small brush for the delicate details around the eyelets and the Keds logo. As the paint dries, you may notice some uneven patches. I used a small brush to touch up any areas where the canvas was showing through. I also painted the tongue, which I thought was going to be a pain but was actually surprisingly easy. You don’t have to paint the whole thing, just whatever’s showing when you have the shoes on. To avoid a mess, wait to paint the tongue until the rest of the shoe is completely dry. It takes a whopping 15 minutes for acrylic paint to dry. I let mine dry on the copper pipe boot tray I made back in March, then put the laces back in each shoe. The only downside I’ve noticed about these shoes is that they do stain fairly easily, though to be fair, I have been wearing mine in the shop as I work on projects. I recommend investing in a waterproof stain-resistant spray like you'd use on canvas or leather shoes, which will help prolong the life and color. And if all else fails, you can always paint right over any signs of wear with a new coat of acrylic paint. 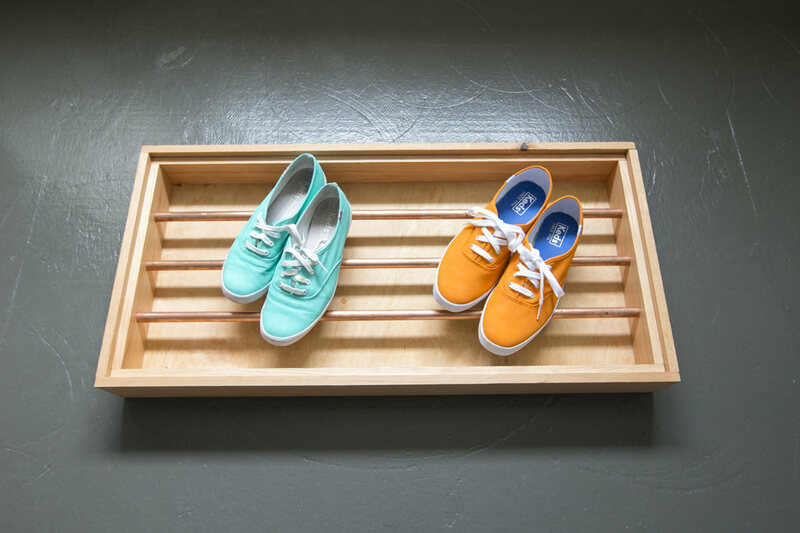 I browsed the entire Keds inventory before I bought my last pair of shoes, and don’t remember coming across any that were as vibrant as the pairs I’ve upcycled. Acrylic paint is a really fun, affordable, and easy way to personalize your shoes while getting extra life out of ‘em. I might even paint a design on my next pair—the options are endless. The holidays are upon us! If you haven't started to think about gifts for your favorite DIYer, we've got a list for you! Organize your blankets on this lovely DIY blanket rack! Or give one as a gift!